The next monthly meeting of RAST will be on Sunday, February 4, 2007, at Sena Place Hotel on Phalyothin Soi 11 (near Sapan Kwai). The informal meeting begins at 11 a.m. and a buffet lunch will be served. All members, their guests and any radio amateurs who happen to be visiting Thailand are welcome. The 2007 Seanet convention in Lampang is tentatively set for Thursday, November 8, 2007 through until November 11. A formal announcement will appear on this website and will be sent to RAST members and friends by email in early January. 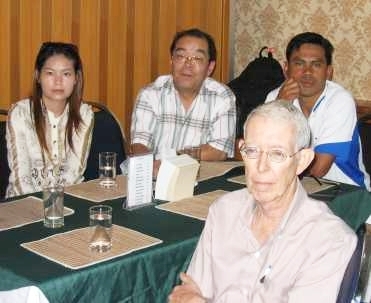 The November 2006 RAST meeting at Sena Place Hotel saw several new faces including Lee, HS0ZHD (WA6MHI) and HS8MSP, both from Phuket, as well as E22NA from Surat Thani and Brian, ZL1ARS, who will be based in Pattaya. RAST President Chaiyong Wongwuticomjon, HS1QVD, briefed those present on decisions made at a committee meeting held earlier in the day while HS0AC station manager Finn, OZ1HET, gave an update on activities; John, W2YR/HS0ZDJ gave an account about the club station activity during the CQWW phone contest while Champ, E21EIC looked ahead to a mini-DXpedition he has planned for the CQWW CW test at the end of November. Finally, Charly provided an update to two rival VU7 Dxpeditions being organised by the two major amateur radio societies in India. (Maybe we need a Naga god of propagation the next time that rare DXCC entity the other side of the world gets activated -- read "XF4" or "3Y0", but I digress). In other developments, members heard that the Electrical Engineering/Electronics, Computer, Telecommunications and Information Technology Association (ETCI) has invited RAST to provide a chapter for the "Thai Telecommunications Encyclopedia" while RAST Secretary Phatanadit (Phat) Kulphaichitra and Maj Narissara (John) Shaowannasai, HS1CHB, will be attending the 2nd meeting of ISO/TC 223 Societal Security during the week of 20-24 November 2006 at the Four Seasons Hotel when the topic will be disaster communications protocols. Members also heard how several schools here were interested in participating in scout Jamboree on the air (JOTA) activities scheduled for later in November and these activities will be co-ordinated for RAST by Uthai, HS1RGF, and Maj Narissara, HS1CHB. Don't hold your breath if you were hoping for an imminent announcement about operating permission for the WARC bands. Maj Narissara (John), HS1CHB, informed everyone that the National Telecommunications Commission (NTC) advises that no spectrum allocation changes can be made without the National Broadcasting Commission (NBC) having a say in this. However, as many will know, the NBC has yet to be formed, and this leaves the long-pending issue of the WARC bands and the low bands in limbo until this happens (and the commissioners get around to addressing radio spectrum issues). In the meantime, RAST will continue to apply for "temporary" permission to operate on the low bands during contest weekends and for permission to operate on the WARC bands for special-event stations or DXpeditions as it has for the past five years. Long-time RAST member who will soon be leaving Thailand Philip Weaver, HS0ZGN, 9M6CT, took the opportunity to bid farewell at the November meeting when he said "thank you" to all his friends at RAST, describing them as "a wonderful group, second to none". He will be returning the the United Kingdom at the end of December after spending 11 years in Thailand. HS0AC Station Manager Finn gave a report on the club station, noting that every Wednesday, Winit, HS1CKC conducts the 40-metre SSB net from the AIT club station. There had been a problem with water intrusion due to excessive leaves on the roof, as well as a termite problem, which had been pointed out to the campus staff, who had cleaned up accordingly, he said. On October 18, a group of contesters had a pre-CQWW SSB contest meeting at HS0AC, comprising John, HS0ZDJ/W2YR, Brian, HS0ZEN, Charly, HS0ZCW/K4VUD, and Bob, HS0ZCG/KL7ENY and Finn, where they mapped out plans for the Oct 28-29 contest weekend while on the weekend of Oct 21-22, Finn operated in the Worked All Germany Contest when he had 212 SSB QSOs with German stations on 15 and 20 metres for 29,250 points. John, W2YR, recounted the CQWW contest activities, which netted 1,527 QSOs for 1,134,555 points for the three operators: Bob, HS0ZCG, John, HS0ZDJ, and Winit, HS1CKC. He explained how he had networked three of the four PCs together and would also find a network interface card for the fourth in time for the CQWW CW at the end of this month. There had been a problem with the FT1000 Mk 5 on 10 metres, but is is believed to be caused by a pin diode on the band filter and will be repaired (thanks in advance, Martin!). The 160-metre band sloper was said to have been very noisy while the low-band frequency allocation in the CW portion of on 80 metres limited the number QSOs that could be achieved there, although contacts were made with South Africa and Europe. John also observed that the towers needed to be grounded for safety reasons. Champ, E21EIC (XU7ADE), then announced that he would be leading a micro-DX-pedition to Cambodia for the CQWW CW contest at the end of the November. Activities on HF (160-10m) VHF (2m and 6m) UHF (satellite) would begin before the contest on Nov 25-26 and continue for a few days afterwards, with operators including: XU7ADF (AA4XR/HS0ZCY), XU7ADK (E21YDP), XU7ADL (E20PFE), XU7ADM (E21QEB - UHF satellite), XU7ADN (HS1JAN - VHF) and XU7ADP (HS5IGY - VHF). 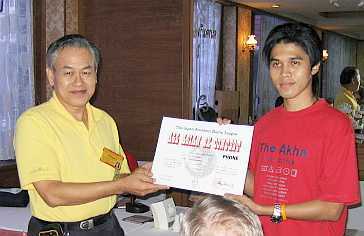 Champ also brought a certificate for the winner of the 2005 All Asia DX Contest to the November meeting and RAST President Chaiyong, HS1QVD, presented the award, for the 21 MHz Phone category for Thailand, to E20PFE. Members were reminded that old IRC coupons would expire at the end of this year and Champ, E21EIC, suggested that anyone who had any to spare should quickly donate them to the RAST QSL manager. New IRCs were now being issued that would be valid for the next five years, he said. Charly, HS0ZCW, was invited to explain about two forthcoming VU7 DX-peditions to the Lakshadweep Islands, the second-most wanted DX entity, when two independently-led teams are set to operate from there, one in December, the second in January 2007. The ARRL website has an account of the activities. Prior to the October meeting, the RAST committee convened and President Chaiyong, HS1QVD, briefed members on the topics discussed. He said that Khun Winit HS1CKC and several other Thai hams went to Seanet in Japan and told the members that the next Seanet convention will be in Thailand and said the exact date has not been set yet but it will be around October or November. RAST members have visited Ray HS0ZDZ at his home and report that Ray's condition has improved a bit but he can not speak yet but does react to people around him. Khun Chaiyong mentioned that RAST had income of 8,600 baht (2 new life members and income from lunch tickets) and expenses of 37,000 baht for hotel catering, ONPA tower costs, club station etc. Those interested in complete financial status report can contact Khun Chaiyong. Khun John HS1CHB told us that the WARC band permision has still not been approved by the NTC. This month we received 2,000 QSL cards from printing, so now our QSL manager Swen, HS0ZFZ, can start to answer the incoming QSL cards. On the weekend 16 - 17 September HS0AC was active in the Scandinavian Contest SAC as SO AB CW on 15 and 20 Mtr. The final score was 120 QSO's and 5,880 points , with poor propagation in the daytime. HS0AC made 2 fine QSO's with the club station SI9AM that is located at the Thai Pagoda in Ragunda in Sweden. RAST member Charly (HS0ZCW-K4VUD) says he wants to build a 2-el. 20m-10m quad and is pricing fiberglass poles for spreaders. He says that it looks like the will cost about 750 baht each (he needs 8) plus unknown shipping costs for telescopic 15-ft poles. Does anyone in Thailand want to join me in making an order, he asks? Charly would also like to know if there is a source of fiberglass poles like this? If anyone has any suggestions or would like to join Charly in making an order, please drop him a note by email. Khun Champ, E21EIC, returned victorious from his participation in WRTC 2006, also known as the ``Ham Radio Olympics'', in Florianopolis, Brazil, where his team -- one of eight in the multi-national, multi-operator, single transmitter category -- came first. The WRTC (World Radiosport Team Championship) took place over a 24-hour period during the IARU HF contest on the second weekend of July when Champ's team, operating PS2T, made over 2,700 QSOs in 24 hours and gained over a million points more than the next closest competitor -- and this, Champ told members, was achieved with a smaller station with fewer antenna towers than the competition. Champ gave a PowerPoint presentation enhanced with photographs of the event which was attended by many elite contesters and was by invitation only. For the first time, the organisers had invited a Thai contester and Champ spent around 40 hours each way travelling to and from the town in southern Brazil. He recounted the history of WRTC, which began back in 1990 in Seattle and then moved to San Francisco (1996) and later Slovenia (2000) and to Helsinki, Finland (2002). Each year the event has grown in size when the invited contest operators compete against one each another for the highest score. Champ passed around the framed certificate he received as one of the operators of PS2T and he recalled how, at the reception party the RAST ``I Love Ham'' badges were very popular and told those present that Brazilian hosts had been unable to find a Thai flag, so Champ had to rush back to his hotel room to provide one. He also observed how the financial collapse of the Brazilian airline Varig a week before the event, offering no compensation to those who had purchased air tickets, had meant that some competitors had been unable to participate. Fortunately, Champ was not booked on that airline and thanked his sponsors, which included the YASME Foundation who paid for his air ticket and RAST, which channelled these funds to him and also provided aditional funds, as did some RAST members. The station equipment comprised two transceivers, a Ten Tec Orion and a Yaesu FT1000MP and, for the first time, a two element beam for 40 metres and also Yagis for the higher bands. For the first time, linear amplifiers were permitted, given that the contest took place at the bottom of the 11-year solar cycle. The next WRTC is scheduled for 2010, and Champ said he hopes to see more Thais taking part then while he also highly praised the quality of the equipment and stations he used, noting how there was nothing to match this in Thailand at present. Before making the WRTC presentation, Champ announced the winners of the CQWW VHF contest for 2003, 2004 and 2005 and provided laminated certificates for RAST President Chaiyong Wongwuticomjon to present to the winners or their representatives in various categories. Thailand always makes a strong showing in this contest and has won first prize for Asia in this contest for several years in a row. The Siam DX Group also presented a plaque for the winning multi-operator entry from HS0AE last year. RAST's delegate to the IARU Region 3 Conference in Bangalore, India, Thida Denpruktham, HS1ASC, discovered at Don Muang Airport on Saturday evening that her Indian visa had expired -- but you will be happy to learn that she was able to get a new visa and was able travel to the conference on Monday evening, so she will only miss one day of the event. This conference, hosted by the Amateur Radio Society of India (ARSI), lasts until Friday, August 11 and will address regional amateur radio issues and will include elections for new directors. The Region 3 conference takes place once every three years. RAST submitted a country paper and a proposal suggesting some new goals for the IARU Region 3 organisation given the role of amateur radio in these changing times. Thida, HS1ASC, makes a point during the conference on behalf of RAST, while in the upper picture, Gopal, VU2GMN, delivers the opening address as IARU R3 directors look on. Prior to the August meeting, the RAST committee convened and President Chaiyong, HS1QVD, briefed members on the topics discussed and decisions that had been made. He said that Brian Lee, HS0ZEN, had suggested requesting a four-letter suffix for the RAST club station at AIT, HS0RAST, now that four-letter suffixes had been approved internationally. This would be a secondary callsign and would be used as an alternative to HS0AC when appropriate. John, HS1CHB, will follow up on this proposal with the authorities. 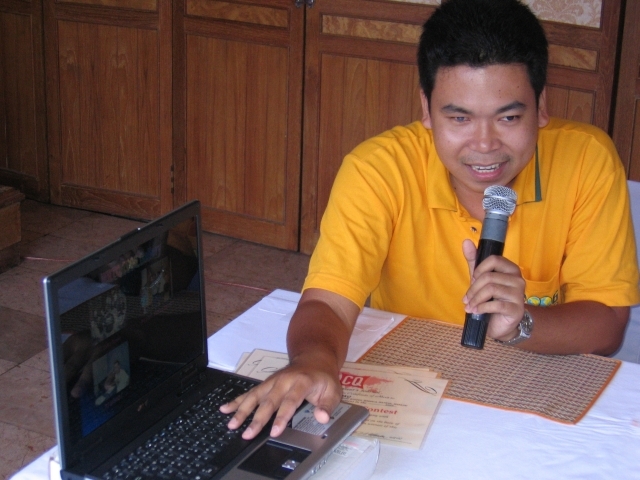 Phatchara, HS1QAA, had proposed that RAST contacts universities and colleges around the country and try to establish links with club stations there. 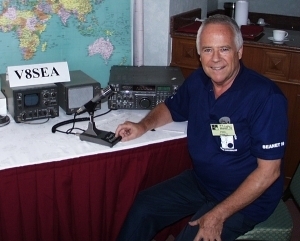 RAST has learned that Rod Stafford, W6ROD, ARRL ex-President and now Vice-President for International Affairs, will be in Bangkok for four days following the IARU Region 3 Convention and President Chaiyong has invited Rod to dine with RAST officers during his stay here. RAST was waiting for his response to an email invitation on Sunday. Finn, OZ1HET, gave members an update on HS0AC, the AIT club station where the good news is that two FT980s have been repaired and are now working. Finn said he had operated during the IARU HF Championships as a single operator, CW, all bands, making 427 QSOs for 172,000 points, the highlight being a QSO with Champ's WRTC station, PS2T, on 20 metres -- and the only HS station that PS2T worked. ``Thank you Finn for the multiplier!'' said Champ. Members also heard how Winit, HS1CKC, had provided a new, second-hand computer to replace a failed PC at the club station. President Chaiyong also told members how CQ Magazine had reported on how Thailand's National Telecommunications Commission had installed amateur repeaters in Sukhothai and Uttaradit to help in flood relief following advice from His Majesty. Fred, K3ZO, HS0ZAR had drawn this to his attention, he said. Meanwhile in Thailand, the Office of the National Telecommunications Commission set up two amateur radio repeaters in Sukhothai and Uttaradit to help provide communications in flood-stricken areas. Manas Songsaeng, deputy secretary-general of the Office of the NTC, said the repeaters would allow radio amateurs in the areas to link together to provide communications networks to assist the authorities in providing relief to flood victims. John, HS1CHB, who is co-ordinating with the NTC on impending permission to operate on the WARC bands and low-bands on a temporary basis until the end of the year, provided a progress report, a rather gloomy one, at that, I am afraid. Apparently, officials now say that they need to wait for the National Broadcasting Commission to be formed before they can do this. John will continue to pursue this, but in the meantime the low bands may be activated during contests on weekends as before. RAST will conduct a two-metre net on 144.9735 on August 11, the eve of Her Majesty the Queen's birthday from 7 p.m. onwards when hams can check in and pass along their best wishes. Since the society is under the patronage of His Majesty the King, RAST will seek Royal approval to organise a Kathin (merit making) ceremony in October. Tentatively, a bus will leave Bangkok on the night of October 6 for Nong Khai. The following day, there will be a tour of the Lao capital of Vientiane, and on Saturday night the bus will travel to Nakhon Phanom. The Kathin ceremony will take place at a temple there on Sunday morning and the bus should return to Bangkok that evening. Members were also reminded that the Seanet convention next year will be hosted by RAST in the northern city of Lampang. to E21EIC as Champ's team (PS2T) wins WRTC 2006 in multi-single category. Champ, E21EIC, who travelled to Florianapolis in Brazil earlier this month to take part in the "ham radio Olympics" otherwise known as WRTC 2006 was part of the winning team of PS2T in the multi-operator, single transmitter category. RAST and all Thai hams extend hearty congratulations to Champ in this achievement, and we are happy to be able to announce that on Sunday August 6, 2006, Champ will speak to members present about his experiences as the first Thai to take part in a WRTC championship. Admission to the August meeting is free to all members and a buffet lunch will be available for 200 baht at Sena Place Hotel (see details on how to get there below). Don't miss our August meeting for a first-hand account by Champ about taking part in this competition, made possible by the YASME Foundation which donated over 91,000 baht towards Champ's travel expenses, channelled through RAST, and with additional financial support from RAST and several of its members. Members at the July RAST meeting learned that the National Telecommunications Commission (NTC) was still processing permission for the WARC and low bands (80 and 160m) and that Deputy secretary of the NTC Manas Songsaeng had told John (Narissara), HS1CHB, that he would try to speed things up. If you have an HF operator's licence and a station licence in Thailand and have not already sent copies of these documents along with a copy of your equipment licence to John, HS1CHB, at P.O. Box 1, Bangkok 10900 to be eligible to operate on these bands, then please do so. One requirement will be that you submit a copy of your logs once a month to John, who will be co-ordinating on this with the NTC. Please monitor this website (www.qsl.net/rast) for details and we will endeavour to notify members by email when permission to operate on the WARC and low bands is received. If believe that you are not on the RAST mailing list but would like to be, please send an email to dx(AT)thai.com and ask to be included. Presiding over the July meeting at Sena Place and standing in for RAST President Chaiyong, HS1QVD, was Gen Prasit, HS1DN, who reminded everyone of the daily RAST two-metre net on 144.9375 MHz at 7 p.m. The net now has up to 70 check-ins and everyone is welcome to do this and don't need to be a member of RAST to do so, Gen Prasit pointed out. HS0AC Station Manager Finn Jensen, OZ1HET, provided an update about the RAST club station at the Asian Institute of Technology where readiness for operations on the WARC bands was among the activities, with antennas being checked by Finn and Winit, HS1CKC on June 10. HS0AC will be the RAST headquarters station in the upcoming IARU radiosport contest on the weekend of July 8-9, while for the All Asia DX contest (June 17-18) 585 QSOs were made for around 100,000 points. Members heard that repairs to the club station roof had been completed and were effective. In addition, a framed world prefix map signed by all the operators in the 3Y0X Peter I island DXpedition and donated to RAST by Capt Philip Weaver, HS0ZGN, last month had been framed and is now mounted on the club station's wall, Finn said. From left, Martin, HS0ZED, and Tony, HS0ZDX, present the Golden Kilowatt's Hans Hollstein Trophy to Nuttida Suphon (Pla), E20YGG, the winner of the 2005 CQWW VHF contest for Asia in the two metres category. July 15-16 is the CQWW VHF contest and Thailand traditionally makes a very strong showing. Recognising this, the Golden Kilowatt Foundation, a small group of expatriate Thai-licensed radio amateurs, last year began providing the Hans Hollstein trophy to recognise the Thailand winner in the 2-metre category. At the July meeting, Tony Waltham, HS0ZDX, and Martin Sole, HS0ZED, presented this trophy to Nuttida Suphon (Khun Pla), E20YGG, last year's winner of the CQWW 2-metre contest for Asia and wished her and all other entries this year good luck in this year's contest. Helping up on the stage with the presentations (and promoting the CQWW contest: check out the Thai Contesting website) was Champ, E21EIC, on the eve of his trip to take part in WRTC 2006. This year will be the fifth time that the World Radiosport Team Championship (WRTC) is being held, and event that has been called the ham radio equivalent of the Olympic Games. Champ will be the first Thai ever to take part, when he will join a team of three Brazilians (PY1KX, PY2YP and PY2NY) and one Ukrainian ham, Andy UU0JM, who will be his ``buddy''. A total of 67 teams with participants from 47 countries will be participating and RAST is most grateful to the YASME Foundation for its support by enabling RAST to help fund most of Champ's travel and accommodation expenses, providing funds of over 91,000 baht. At the June meeting RAST also pledged separately to provide and additional 20,000 baht, while previous past RAST president Khun Mayuree helped with a donation of another 10,000 baht and other members present donated 7,800 baht towards his expenses. Members wished Champ every success during WRTC 2006 in Florianopolis later this month. Look out for the callsign PS2T during the IARU Radiosport championships contest on the weekend of July 8-9 -- but also try to work a few other stations in the contest to prevent your callsign from being a ``unique'' in that station's log, was the advice from Charly, K4VUD/HS0ZCW. Champ also suggested to check this website while he is in Brazil for daily updates: pictures and video of his activities there, which he intends to post. Hams from King Mongkut Institute of Technology's Lad Krabang campus were recognised for their activities and a DXCC award was presented to E21YDP during the meeting before Khun Mayuree handed out plaques of appreciation to members of the 2004-2006 RAST committee. 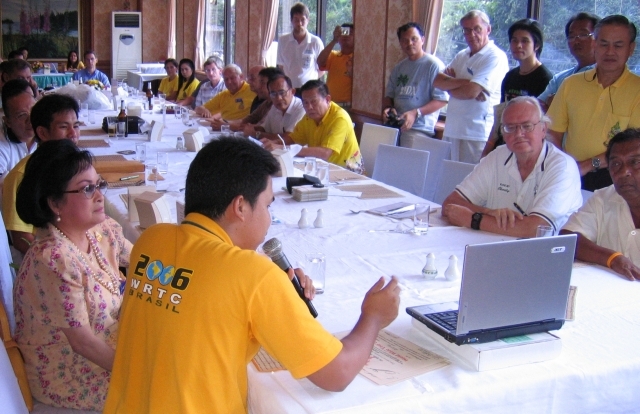 The Radio Amateur Society of Thailand will host the 2007 Seanet Convention in the northern city of Lampang while permission to operate using the WARC bands and on the 80 and 160 metre bands may be only days away, members heard at the June meeting. RAST representatives also met with the National Telecommunications Commission (NTC) on June 1 when they submitted proposals for a disaster relief centre along with a proposal that the NTC host an exhibition and activities around communications to mark the 60th anniversary of His Majesty the King's accession to the throne. RAST would also be participating in another meeting at the NTC to discuss a national emergency plan scheduled for Monday, June 5, some 35 members and guests heard at the meeting. RAST President Chaiyong, HS1QVD also announced that the YASME Foundation had generously offered to fund a trip by Champ, E21EIC, to Brazil in July to participate in WRTC 2006, while RAST also pitched in to help with additional funds. After a short period of three years, the Seanet convention will return to Thailand next year after the RAST committee listened to presentations by Khun Ponwat, HS1XIM, and deputy governor of Lampang province Wanchai Suthivorachai. Seanet 2007 will be staged in Lampang, northern Thailand, a city famous for its ceramic handicrafts and which has a history going back more than 1,300 years. Seanet delegates in Bangalore last year had voted on a proposal to host the 2007 event in Thailand and the RAST committee formally undertook to organise the event next year during their June 4 meeting. Dates for the convention have yet to be decided, but will be finalised in time for the Seanet convention in Osaka, Japan which is being held from Sept 14-17 this year. Bangkok was host to the 2004 Seanet convention, which has also been staged in Chiang Mai (1991), Koh Samui (1995) and Pattaya (2000). The long-awaited permission to operate on the WARC bands (30-, 17- and 12-metre bands) is just around the corner, according to John (Narissara), HS1CHB, who said that the NTC had agreed to issue temporary permission for those radio amateurs in Thailand who notify them of their desire to do so. To qualify for this privilege, which includes permission to operate on the 80 and 160-metre bands, operators should send a copy of their station licence, their equipment licence and their operator's licence to John at P.O. Box 1, Bangkok 10900. They should also submit logs of their operations on these bands to John on a monthly basis, as the NTC requires that these be submitted as well. This temporary permission will be valid until the end of the year, and officials said that the yet-to-be-formed National Broadcasting Commission would need to be in place before any permanent spectrum changes could be made. Important: John asks that you please send the documents by mail to his PO Box and not as email attachments because his mailbox quota will not support large attachments. The operators who keep RAST's 2-metre FM net running daily between 7 p.m. and 8 p.m. were introduced to members at the June meeting, the line-up being HS4DDQ, E21NNI, HS0UID, HS2ZMU and E20ZFD. English-language check-ins are also welcome. Daily, on 144.9375 MHz. This year will be the fifth time that the World Radiosport Team Championship (WRTC) is being held. This event has been called the ham radio equivalent of the Olympic Games and, for the first time, a Thai operator will be taking part. Champ, E21EIC, has been invited to attend the event being staged in Florianopolis, a coastal city in southern Brazil, from July 5 - July 10. A total of 67 teams with participants from 47 countries will be participating and RAST is most grateful to the YASME Foundation for its support by helping fund most of Champ's expenses. At the June 4 meeting, RAST pledged a further 20,000 baht, while former President Mrs Mayuree, HS1YL, provided 10,000 baht personally and members present donated 7,800 baht towards the estimated 160,000 baht needed for Champ's travel and accommodation expenses. Any licensed radio amateur may use the RAST club station HS0AC at the Asian Institute of Technology's campus by first making a reservation with the station manager (oz1het(AT)yahoo.com) by email, giving at least one week's advance notice. On arrival at the station by appointment, the guest operator most provide a photocopy of his home licence and passport. The guest operator must pay a fee of 600 baht for membership and administration expenses for a one year membership of RAST, or 2,100 baht fee for ordinary life membership or 5,000 baht for Gold life membership. (Being a member of RAST is a condition of the club station licence). On behalf of RAST, former president Mrs Mayuree, HS1YL, presented certificates to Champ, E21EIC, (for coming in 10th place worldwide, single operator, mixed mode), to E21YDP, HS8KAY and HS0AC (for being a headquarters station) in the 2005 IARU HF Radiochampionship. 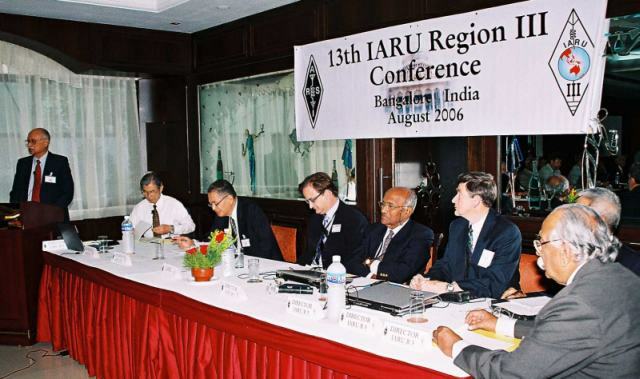 RAST has formally appointed Thida, HS1ASC, as its delegate to the forthcoming IARU Region 3 conference to be held Aug 7 to Aug 11 in Bangalore, India. Capt Philip Weaver, HS0ZGN, donated a zone map of the world that has been autographed by all the operators of the recent 3Y0X DXpedition to RAST and this map will be framed and mounted in the RAST HS0AC club station at the Asian Institute of Technology campus in Pathum Thani. Philip mentioned that at the end of the year he would be leaving Thailand for the United Kingdom and he said this donation was a token of his appreciation to RAST for the 10 years that he had been a member of the society.